I heard about the helipad proposal this morning 30 Jul 2012 on RTE. Supposedly it would be to airlift casualties from the top. However from the programme I gather Mayo Mountain Rescue has come out against. While I haven't seen their statement, with a moment's consideration it is possible to see obvious difficulties with the helipad for rescue. How many accidents actually occur on or near to the top? Surely most occur on the steep ground often some distance from the summit area. So in a rescue using the helipad the unwell and often unfit victim has first to get to the top. And this could be a climb of hundreds of slippery metres and extremely difficult. And frequently the top is covered with mist and extremely cold anyway something we saw the time we were with Matt Loughrey as he completed his 365 summit ascents last year. No, the helipad would be almost useless for mountain rescue. But, folks, what would it be ideal for? Helicopter trips by sightseers to the top of course. See the historic view over Clew Bay! Only Euro 199 (just 299 if you weigh over 250 lb) Go in style. See Ireland from the air, the high point of your visit. Drink in the peace and tranquility and stunning views (as you shatter them). Bring your child after first communion. Celebrate YOUR marriage on the Reek. Think of the local jobs angle also. Karl Boyle chief officer of Mountaineering Ireland did his affable and informed best to counter the proposal on RTE. Actually, too affable at first until the presenter reminded him he was here to oppose the thing. But he settled down and made the points systematically. He was lucky because the proponent of the helipad became incommunicado so Karl could further develop his case which he did including mentioning that an assessment had been done of the place and MI are hosting a conference "Helping the Hills" which this website has already promoted. However for my money in a contest between local enterprise with all sorts of fake suggestions like "aiding mountain rescue" and MI, the outcome may not be too clear cut. Why? Because it smacks of An Taisce versus Jackie Healy-Rae. Or an east coast elite versus the local people who will be sold on employment or whatever. Mountaineering Ireland has created and fulfilled a role in insurance, training and activity regulation but has yet to achieve much in sport development (except for climbing) or inspiration. It sat on the sidelines and pontificated about challenge walks for a decade and currently does much the same for charity walks. It needs to learn to capture the imagination of walkers and local communities with sport initiatives. And ditch the name. If 90% of your actual or potential members are solely hillwalkers then this must be reflected in your name. If you want to address national issues on mountains, the name needs to be immediately relevant and symbolise a non-elitist approach to the audience. So, right with MI for opposing the helipad. And I hope that many regulars to this website will back that. But shouldn't MI reflect on its stance. 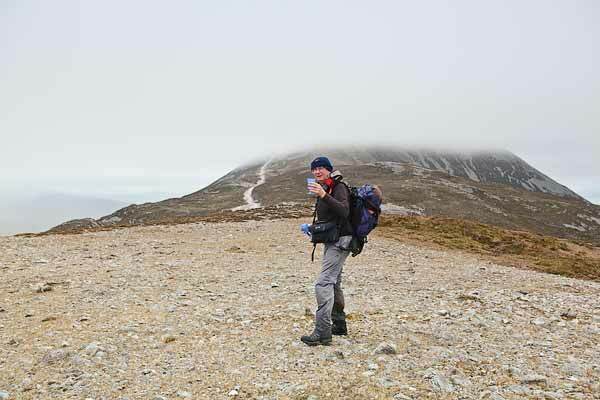 Photo: Celebrating Croagh Patrick from its East Top, June 2011. There were hundreds of people on the Reek that day but could any of them really rely on a helicopter rescue given the mist?